The time has come for our “bear couch” to retire. As Matt and I look toward the new year, we decided that would include a new couch. Consequently, that also includes some couch strategy. 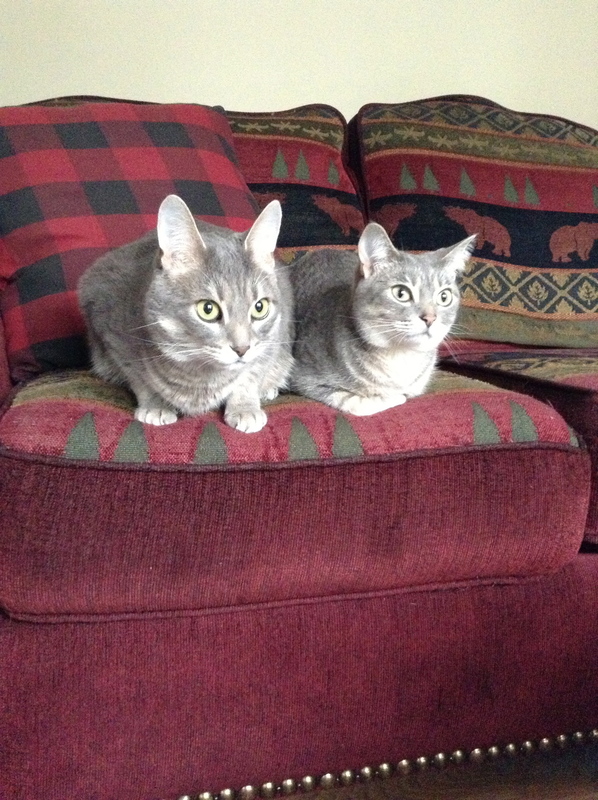 While there are certainly some things that I’ve learned to not care too much about when having CH cats, I did want to take our CHers into account when picking the right couch. How so? Glad you asked. – The back of the couch. Some couch backs were one piece, others had thin backs with separate back cushions. Ellie loves sitting on the back of the couch, so we figured a thicker back would work best for her. The fabric swatch after lots of plucking! – The height of the couch and the space (or not underneath it). We wanted to make sure the cats could climb onto the couch easily, and if necessary, climb under it. – And naturally, the fabric is key. 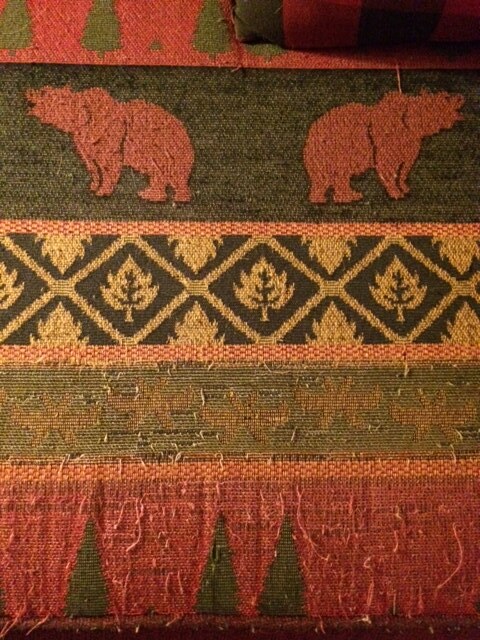 Our bear couch had a beautiful, woven almost tapestry-like fabric on it. Unfortunately, those fabric strands and strings were easily snagged, pulled and torn. So when looking for a new couch, we decided to take the fabric into account. We wanted something that (if possible) wouldn’t show wear so quickly. 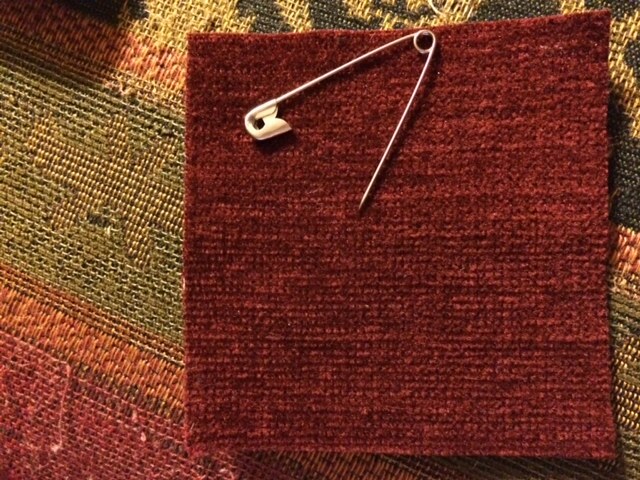 Thankfully we got a fabric swatch, which I then tested at home with a safety pin. I plucked and plucked away at the fabric, trying to mimic cat claws. I’m happy to say the swatch passed the test (it didn’t show a thing! ), so I’m hoping that’s a good preview of what’s to come. I’ll be sure to keep you posted! I have two couches, both bought 20 years ago when I moved into this house.I’ve had cats this entire time. While the couch in the living room is completely falling apart and has a slipcover on it (It’s a fantastic Pennsylvania House couch–I’d love to get it recovered), the hide-a-bed here in the tv room doesn’t have even a mark on the fabric (the bed is too worn out and uncomfortable to sleep on). It has a firm, curved back that Dotty sits and stands on using her claws while looking out the window at the birdfeeder. It’s a woven fabric, just nearly indestructable. I have two chairs in the living room that seem impervious to a cat’s claws too. Getting a swatch like you did and testing it sounds like an *excellent* way to test it out. We have just recently been through the same thing. The cats were forefront in our minds when searching for the perfect couch and the perfect fabric. Unfortunately, I don’t think such a thing exists. The couch we love and so do the cats as it has wide arms and back, great for cats to drape themselves on. But the fabric is too easily clawed. A bit of damage has been done by Annie, my CHer but all the cats seem to catch their claws on it far too easily despite the sales person suggesting it as good for cats. We did toss up between this tight weave and a microfibre fabric and I think the microfibre might have been better in hindsight! As in one of your earlier posts there are things you learn not to worry about when you have pets and you also learn to appreciate a nice polar fleece blanket for covering up any damage! Good luck with your choice.